Tammi Leader Fuller is an Emmy-Award winning TV producer who walked out of the control room and into the woods to take people to her childhood happy place and help them align with their life purpose. 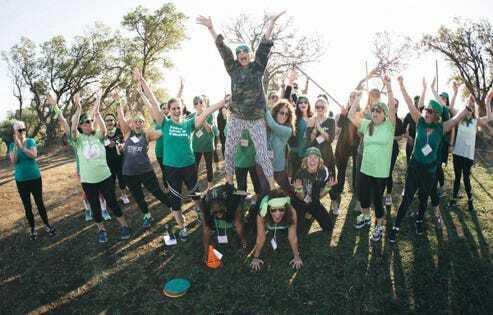 Leaving behind her successful career at NBC News, The Today Show, CBS News, and EXTRA TV, in 2013, at age 53, she created Campowerment, a sleepaway camp experience that wraps an empowering, expert-led curriculum around fun and games. In just five years, Leader Fuller grew Campowerment to include over 30 camps serving 5,000 happy campers. What began as a women’s-only brand morphed into a corporate co-ed retreat space, helping companies and organizations rebuild their cultures through the power of playtime. Events have taken place at high-end kids’ summer camps from Malibu and Ojai, California, to the Catskills and Poconos Mountains in the Northeast. In 2016, Leader Fuller created Give Her Camp, a non-profit designed to help deserving women get to Campowerment on scholarship. Here, Leader Fuller offers stories of five participants who say that their 72 hours at Campowerment helped them discover what they were meant to be doing with their lives. Each one made a big change to align her career with her life purpose. Vieweg spent her whole career at Nestle USA, and recently walked away from a huge job as a Corporate Training Manager in HR. Her own personal Campowerment experience was so profound that she brought it to Nestlé and convinced her bosses to take 100 of their women leaders to a Campowerment retreat in October 2018. And then she quit. Moss is an experienced social media strategist and project manager who spent years perfecting her craft in the world of television production at Warner Brothers and E! Entertainment. Then in 2012, her brother died by suicide, and she started searching for a community of support. Three-plus years later, Moss moved to DC to become one of the last President Obama appointees, working at the National Endowment for Humanities (NEH), where she was hired to run the government agency’s social media marketing and redesign their website. That same year, ahead of the move and new job, she says Campowerment helped her open the door to acknowledging her grief. Encouraged by her journey at Campowerment, Moss decided to volunteer at Experience Camps, a one-week camp for kids who have experienced the death of a parent, sibling or primary caregiver. It’s a place where kids can laugh, cry, play, create, remember the person who died, or forget the grief that weighs them down. She loved volunteering there so much that she applied for a full-time job to become the newly-created National Program Manager for the organization. She’s using her digital expertise to help this nonprofit grow and prosper, and at the same time, continuing on her grief journey as she helps others do the same.